His mom said she couldn't believe it when she saw what he'd done. Baloo - the water sprinker-loving Border Collie in Lake Dallas. A North Texas dog found a unique way to beat the recent record-breaking heat. 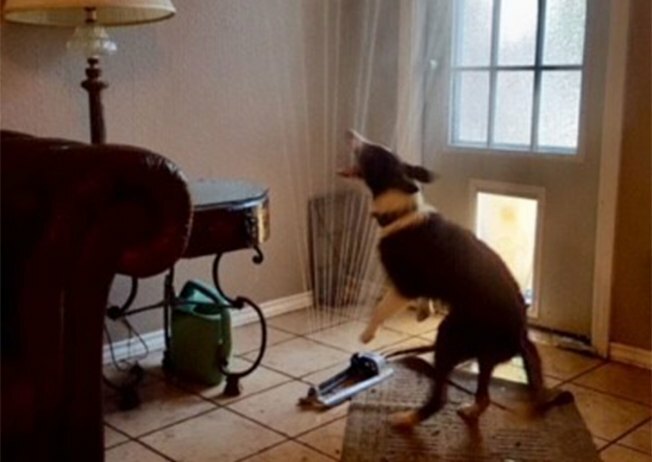 Cara Wohr says she was reading a book in a bedroom of her Lake Dallas home last week when she heard a loud noise coming from her living room and then her dog started barking. Wohr said she jumped up to check out what was going on and couldn't believe what she saw. Her 5-month-old Border Collie brought his favorite outdoor "toy" inside. Baloo had dragged the running water sprinkler through his doggie door and right into the living room, soaking everything in sight. Wohr said her mischievous puppy loves to play in the sprinkler and must have figured it'd be fun to bring it inside. She snapped a photo of her dog in action and posted it on Facebook before taking the sprinkler back outside. ""That moment when your puppy drags the sprinkler through the doggie door," Wohr wrote on Facebook. "Good thing I was wearing waterproof mascara." The post went viral and by Thursday afternoon, Baloo's sprinkler picture had been shared more than 127,000 times and garnered 24,000 likes. "I'm overwhelmed. When I first posted it, I thought I'd get 100 likes," Wohr said. "Now, I've had people from Uptown to Germany talking about this with me!" Wohr says she named Baloo after the bear in the Disney book and movie, "The Jungle Book."